For the past nine months, David Grzech has fielded calls from The UPS Store customers who want to know if the store in the Boynton Plaza is open. It is. But it’s difficult to tell because the shopping center, anchored by what will be a new, modernized Publix, is under renovation. While the stores are open, except for Publix, the majority of the parking lot is blocked off. Grzech says the confusion will soon be over, and it will be worth it, because he hopes an updated center will bring more foot traffic. The Boynton Plaza at Boynton Beach Boulevard and Congress Avenue is the latest shopping center in the city to get a face lift. 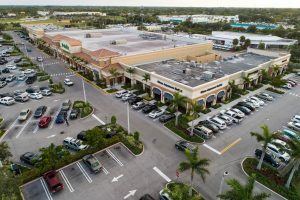 The two plazas in the Cross Creek Centre on Boynton Beach Boulevard are being renovated, and the Boynton Lakes Plaza and Sunshine Square were redone in recent years. While the construction has caused headaches for Boynton Plaza’s tenants, they say they can’t complain — too much — because it should bring in additional business. Boynton’s Principal Planner Ed Breese says it will. Grzech says there is a lot to be happy about at the Boynton Plaza: New LED lighting, a paved ramp in front of the store and more spots in the parking lot. That’s what most are excited about: The Publix. It is expected to open in March. The new store will be 54,000 square feet, which is 18,000 square feet more than the old one. The Publix will have a new color scheme with more earth tones. Each department in the store will be bigger, and it will have a pharmacy. 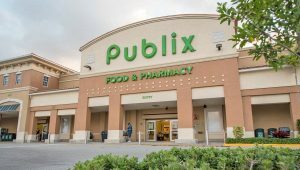 Modernizing the Publix was a condition of the grocery store chain resigning the lease, said Tony Davis, a project manager with plaza owner Equity One. The Publix had been there for about 40 years, he estimated. Less than a mile east of Boynton Plaza is Cross Creek Centre on Boynton Beach Boulevard. While the center hasn’t been there as long as Boynton Plaza, it’s been there for at least 20 years. Molly Lidke, the office manager at Comfort Care Dental in the centre, said the construction started about a month ago and has caused customers to drive past the location. Plus, she said, she’s had to steer clear of the nails and screws in the parking lot. But a new roof, awning replacement, painting and a new face for the two adjacent plazas were necessary, Lidke said. Before all that, the center looked the same as when she first started with the office, about 16 years ago. 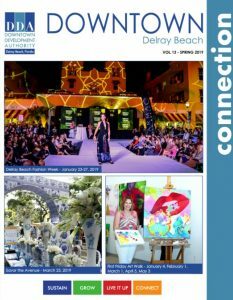 Click the image or link below to head to the landing page to read the latest newsletter on Delray Beach Business developments.